Over the last year, I have been working myself into the world of makers. I have generally focused on building electronics projects because I understand electronics and make use of that knowledge regularly in my day job but I don’t get to do much in the realm of actually designing and building electronics. There have been several times where I have been building a project and realized how useful an oscilloscope would be to look at the signals on the lines or the voltage change over time rather than the snapshot offered by my trusty DVM. I recently had the opportunity to review an oscilloscope that was just what this maker needed. Let me start out by stating that this doesn’t actually compare to the high-end models as far as sampling and bandwidth. You won’t use the iMSO-104 for extremely high speed GHz frequency signal applications. Honestly, for home maker use, I don’t see this being an issue for a long time. Oscium provided a scope for my review and before it even arrived I thought of my list of features to look for and try out. So what were some of the things that I was looking for in using the scope? First, being based on an iOS device, I was looking for a simple and navigable interface. Check. The scope plots zoom just as you would expect with the common iOS finger pinches and spreads. The traces are easy to drag up and down as you would expect as are the measurement cursors. Measurement cursors! That was another item! In the video linked above, Collin shows how you can make measurements on an old CRT scope using the time per division and volts per division selection and visual cues. On some of the digital scopes I have used, you could bring up a cursor that would give you the time or voltage between the points. This scope includes those cursors and if you know what I am talking about it is just as easy to use and intuitive as you think. If you don’t: trust me, it is very intuitive. The Oscium scope can also do all of those things you would expect from any scope: triggering, running measurements, the ability to freeze the display, screen shot, data capture, email, and configuration saving. The unit supports a single analog probe and four digital probes, all included in the kit. You can run all five inputs at one time or select any combination to show. I looked at a number of different signals through the scope and found some interesting and unexpected items. Lets just say that when the Arduino documentation for the delay() function says you don’t want to use it for critical timing beyond tens of milliseconds, they are serious. It is insight like this that might help you solve that next funny problem that you have with your project. I really didn’t mean to write such a glowing review but I have to say that I am very impressed with this scope. There are only a couple things I would say could use improvement. The zoom function, as I mentioned above, works with the normal iOS finger swipes but sometimes you may inadvertently change a scale you didn’t mean to change if you aren’t pinching close enough to horizontal or vertical on the display. This got me a couple times. There is also the location of the trigger point. A quick button on the scope to recenter this marker when you zoom would be a useful feature. Those are the only two real issues I found in my operations and I did a great deal of exploring. The amazing thing is that those and many other enhancements are fixed with software updates to the iOS app. You can check out the app itself for free and take the interface for a spin. It has a demo mode that lets you see what the scope can do. The Oscium iMSO-104 is available directly from the Oscium website as well as a few other retailers such as ThinkGeek for $299.99. Oscium also makes an iOS enabled RF Power Meter, Spectrum Analyzer, and combined Power Meter/Spectrum analyzer. 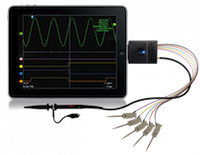 I love this idea of using iOS devices to drive instrumentation! Speaking of ThinkGeek, would you like to win a coupon code for $10 off your next ThinkGeek purchase of $30 or more? Of course you would, and we have five of them to give away! Just use the form below to enter, or if the form doesn’t work for you for any reason, enter here instead. All entries must be received by 11:59pm Eastern Time on Saturday, December 10 — we’re doing a short giveaway to make sure winners can use them before it’s too late to get the stuff they order for the holidays.